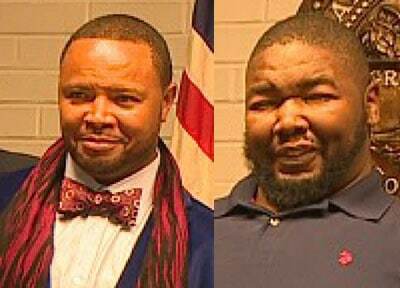 BROWNSVILLE TN (Tuesday, November 13, 2018): The Brownsville Haywood County Rescue Squad has named Patrick (left) and Gregory (right) Shields as Grand Marshals of this year’s Christmas Parade. The individuals are chosen for their unwavering support and contributions to the community including their heroic actions during the evening of October 5, 2019, at the Haywood High School football game. As Grand Marshals, the Shields’ duties include lighting of the Community Christmas Tree at 5 p.m., Saturday, December 1, on the courthouse lawn and then leading the parade at 6 p.m. The Shields brothers are Haywood County natives. Patrick graduated from Haywood High School in 1996 and Gregory graduated in 1998. Both are members of Upper Salem Baptist Church where they attend with their families. Patrick has served in the U. S. military since graduation. He spent three years in the Army before coming back to Brownsville to serve and work with the 1175th Tennessee Army National Guard Transportation Company. He has served in the military for a total of 22 years, to date and deployed twice to Iraq. He is married to Adrian and they have three children. Their son, Taylor, is 17 and a HHS football player. Daughters Chelsea and Cassidy are six and four, respectively. Gregory went into the family’s farming and lawn service business after graduating. He continues to help his grandfather with Harris Lawn Service. He is the father of 14 year old Key-wanna. When asked about their newfound hero status, Patrick explained that “instincts took over” and they had to do whatever they could to “help keep everyone safe, including my own family.” Both brothers are thankful that things went the way they did. Parade entry forms can be obtained at City Hall, 111 North Washington. Deadline for parade entries is Friday, Nov. 23. There is no charge to enter the parade. Other Christmas activities planned for Dec. 1, include a Children’s Parade at 2 p.m. at the courthouse. Santa will lead the children who are invited to dress in festive clothing and bring your bikes, tricycles, scooters, wagons and more to ride or push in the parade. Santa will then remain on the square for pictures and visits until tree lighting time at 5. Mrs. Claus will be at the courthouse for Story Time at 2:30 p.m. She will be reading classics and other well known books to the children. Dress warmly and bring lawn chairs as you gather to hear these holiday tales. Enjoy live Christmas music presented by area choirs and groups on the courthouse lawn from 3-5 p.m. The Community Christmas Tree lighting will be at 5 p.m., followed by the parade at 6. Those wishing to view the parade are invited to line the streets along East and West Main Streets from Boyd Avenue to McLemore Street. For more information, contact Squad Captain Dwayne Duncan or any squad member.